Radishes are a popular, edible root vegetable with a pungent or sweet taste that blends well in salad recipes. They can also be cooked or pickled. They come in various colors – white, red, purple or black and can be long, cylindrical or even round in shape. 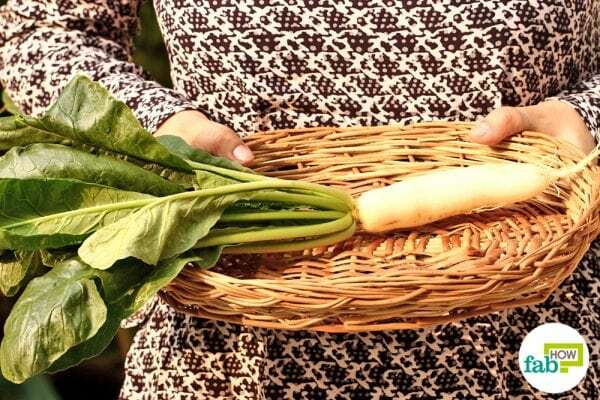 This water-rich vegetable is a good source of vitamin C, several B vitamins, calcium, iron, fiber, potassium, manganese, magnesium, and phosphorus. When it comes to taste and nutritional profile, organic radishes are the best as compared to hybrid varieties. Because conventionally grown radishes are treated with pesticides and artificial fertilizers, organic radishes are much healthier. Organic produce is not always readily available in the market or, if it is, it may be more costly than many can or care to pay. Organic radishes are one of the easiest vegetables to grow, and they mature very quickly which makes them an ideal crop for children to grow. 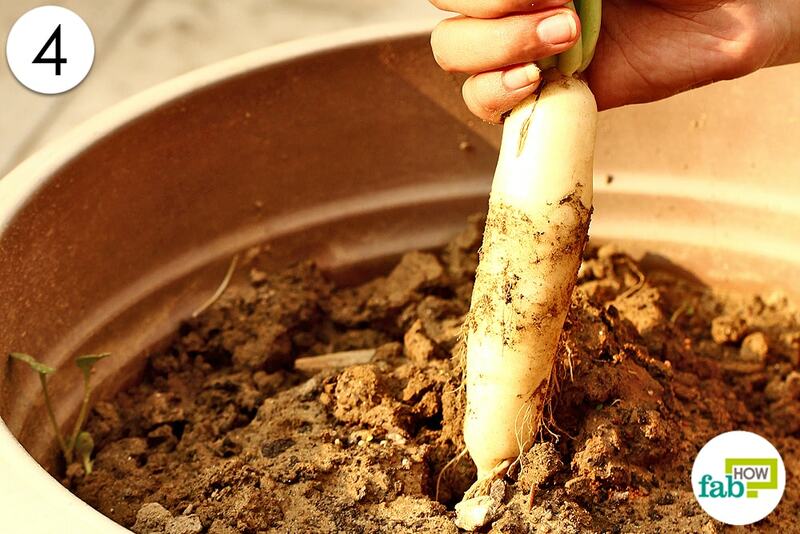 Because of how easy and quick radish is to grow, all you need is fertile, well-drained soil with consistent moisture and plenty of sunlight. Most radishes grow best in cold weather, so you can plant them early in the spring as soon as the soil is dry enough to work and no longer frozen. Some radishes tolerate heat better than others, but most do best in spring or fall when the daytime temperatures stay below 80 degrees. 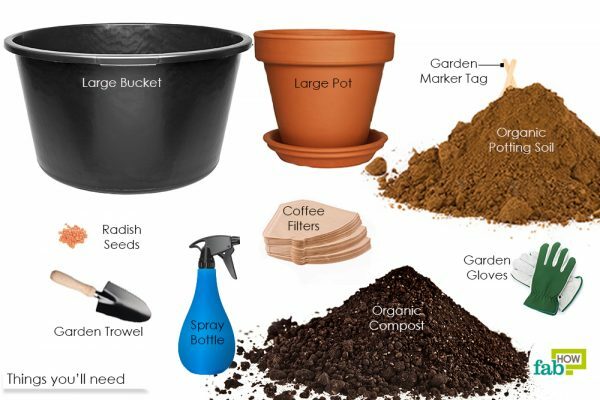 First, prepare the soil by placing equal parts potting soil and compost in your bucket or bin and mixing it with your hands to create a fertile base for the radishes to grow properly. Put some landscape fabric or coffee filters in the bottom of the pot to cover the holes to ensure the soil doesn’t leak out of the drainage holes. Do make sure your pot has holes in the bottom so excess moisture can drain out. Transfer the prepared soil into the pot. While doing this, if you find any stones, rocks or waste materials in the soil, simply remove them. If left in the soil, they can damage the root when it grows. Soil should not be packed down firmly, but also shouldn’t be overly loose and fluffy. Try tapping the pot on the work surface a few times to settle the soil some. 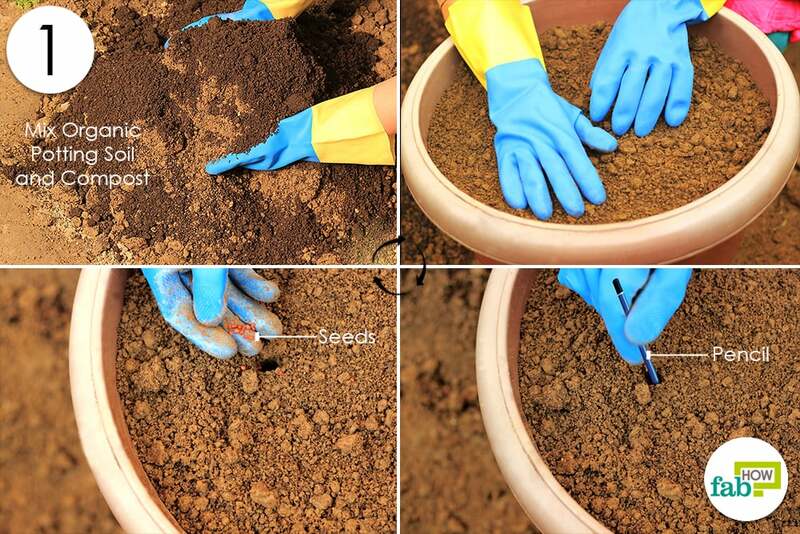 Using a pencil, make small holes evenly spaced in the soil’s surface. Holes should be ½" deep. In your 12" pot, you can plant about 4-5 radishes and keep them 2 inches apart. Crowded plants will not grow well. Put 1 in each hole and cover it with a light coating of soil. Water the seeds twice daily to keep the soil moist but not soaked. While watering, keep the pressure to a minimum as excess pressure can wash the seeds out of place. Within 2 to 3 days, you will notice the seedlings are beginning to emerge. Water the seedlings daily and keep an eye on their progress. Don’t keep them overly wet or you can cause them to rot, but don’t let them completely dry out either. Keep the plant where it gets plenty of sunlight daily, preferably 5 to 6 hours of sunlight. Without sunlight, the edible root will only grow to a very small size. Depending on what type of radish you are growing, most will grow from seed to harvest in 22 days up to 60 days. Most grow very quickly. You will see the top of the edible part above the soil when it is ready to pick. Gently pull the entire plant out of the soil with your hands. The roots should come out easily. Wash the roots and leaves with clean water, and enjoy your fresh radishes in any form. For later use, dry them thoroughly and store them in a cool, dark place for up to 2 to 3 weeks. You can even store them in the refrigerator but after removing the tops. 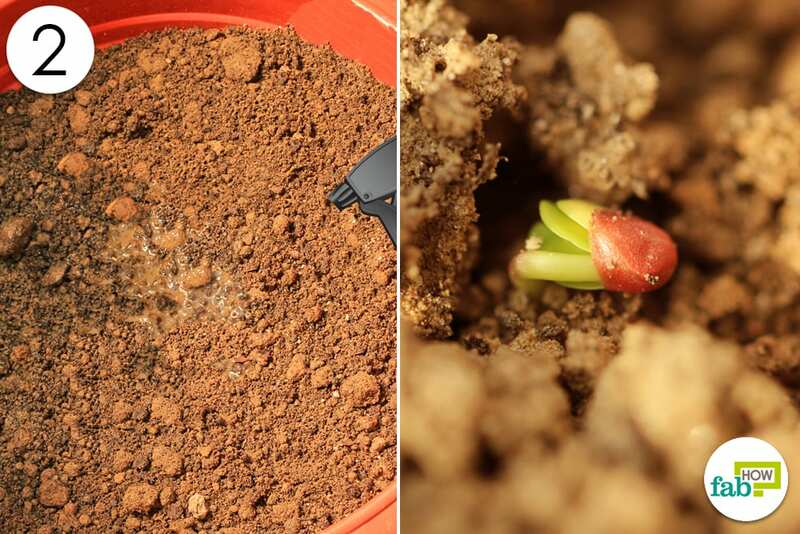 The seeds will germinate in 2 to 3 days in moist conditions as long as you are using fresh seeds. Check the date on the seed package before use. Keep the soil evenly moist but not waterlogged to enjoy juicy and tasty radishes. Uneven watering will cause the radishes to have cracks and they will not taste as good. During the growing period, control the weeds if growing outdoors. Harvest them as soon as the roots mature. Oversized radishes are tough or woody in texture and often don’t taste very good. Avoid growing radishes in the summer months when the outside temperature is too high. Also, protect the plants from frost by covering them or bringing them indoors if the temperature will drop below freezing. You can grow radishes indoors in containers under right conditions. Typically you need good quality grow lights for plants to have success indoors. Soil that is dry and forms a crust in dry weather is not suitable for growing radishes. Before storing the radishes in the refrigerator, make sure to remove the tops. Typical pests that bother radish are flea beetles, and these are somewhat difficult to control. The easiest method is to cover the plants with a lightweight mesh to exclude the insects. 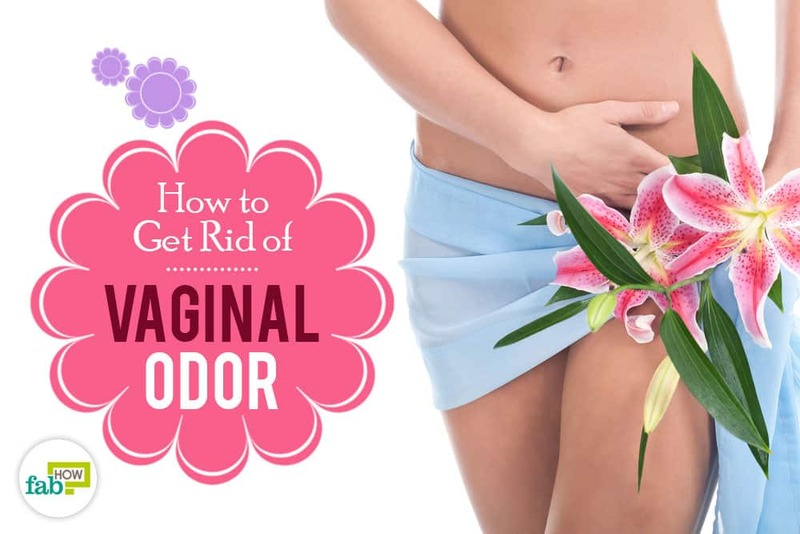 Alternatively use an organic pesticide such as spinosad which has been known to be successful, or even dusting the plants with talcum powder can help.